Which helmet is the lesser of two evils? K100-forum.com » General discussion » Which helmet is the lesser of two evils? Seeing this bike was an unplanned purchase, I don’t have a helmet that “fits” the style of the bike. Wondering which helmet is a better choice until I find a more suitable one? Either a full face or full face flip front. Full face offer the best protection, flip fronts offer nearly the same protection if you don't ride around with them up. They do however offer more convenience when stopped briefly to take a photo, have a drink or a quick bite. Another thing to take into consideration is the weight of the helmet, if you have any neck problems go for a light one. If this is a consideration when you go shopping take a small digital scale with you and weigh the helmet. I am also assuming that you will be buying an approved helmet. Open face helmets don't do much if you do a face plant. One disadvantage of the full face helmet is it can restrict peripheral vision in traffic. The flip top head helmet allows you to lift the chin piece up in traffic and affords better visibility, then you can slip it back into place at speed once you're out of town and into the wild blue yonder appreciating the zen-like meditative effects of the motorcycling experience. er yes.. out of town. I am currently using an Rjays Tourtech III which I find to be good, though others complain of wind noise. Noise can be a problem and it doesn't seem to be related to the cost of the helmet. I have a rather expensive Nolan flip front with the extra tinted drop down visor and the ability to take blue tooth intercom. 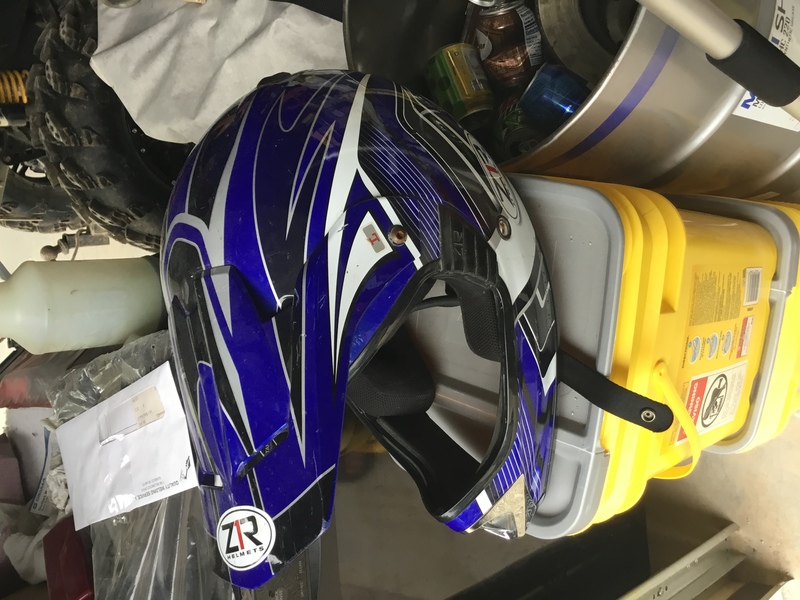 I also have a full face RXT that I picked up brand new still with the tags and visor cover and bag for $5.00 Au at our local recycle (Dump). It had been incorrectly marked as XS when it was actually an M. The Nolan looks cooler has heaps more features, but is heavier and heaps noisier. My preferred helmet is now the $5.00 which is the quietest helmet I can remember owning. The shape of your head has a lot to do with how quiet a particular brand helmet will be. Unfortunately you can't try a helmet before you buy it. Maybe motorcycle shops should have wind tunnels so you can compare helmets. Kathy - both of those may be legal in the US, but neither is suitable for any serious motorcycling use. The crash protection just isn't there. I'm a paid up member of the full-face flip-front club; my helmet of choice is a Shoei Neotec. Martin is right about helmet shape. The joke in the UK is that you're either a Shoei head or an Arai head. There's a follow-up too; we have a saying on this forum - ATGATT - all the gear all the time. A good helmet is just the start of it but you need the rest (jacket, trousers, boots and gloves) to go with it. Trust me; a decent set of kit is likely to cost more than you paid for the bike. In my case I paid £700 for LFB and £1850 for the riding kit (okay - so I already owned it before I bought LFB! ). Two years ago last January I walked away from a 55mph crash when I came off on a patch of diesel. My riding kit absorbed most of the impact from the long, long slide that resulted. The total damage to me was a bruised hip bone. @Kathysresto wrote: Wondering which helmet is a better choice until I find a more suitable one? The blue one in the top image. It'd be helpful if it had a face shield. Here's a fun diagram showing impact areas in motorcycle crashes, compliments of the New York Department of Health. You don't need a helmet. You're in Wisconsin. The full-face flip-front helmet. When my brother and I were starting out on motorcycles, he had a fall when he encountered gravel on a corner. I still remember all the blood on the petrol tank when he finally got home. ...and there's always the videos on YouTube to put a shiver down your spine! Agree that the Blue one is better than the Black one -- temporarily. Find a good full-face helmet quickly and my personal recommendation is a Schuberth C3 Pro. They are top of the range in price and performance, quietest helmet on the market, lots of features and very comfortable. I had a lineup of Shoei modular helmets before the Schuberth - Duotec, Neotec, and Multitec. The Schuberth has outshone them all. For an RS: One with a shield. I've ridden RS bikes without a helmet and without a shield it's very windy and you'll eat a lot of bugs. For any bike: A helmet that fits (a well-fitting helmet protects your head better if you do have a getoff) and one that is comfortable so that you can actually enjoy riding. And don't take anybody else's brand or model recommendations. Different helmets fit differently and everyone's head is different. What works well for one person may be awful for another person. Go to a shop that will let you try them on and find one that works for you. Do some research. There's plenty of web pages/sites on how to get the right helmet for you. @duck wrote: Different helmets fit differently and everyone's head is different. What works well for one person may be awful for another person. Go to a shop that will let you try them on and find one that works for you. To get the most out of your motorcycle you will have to buy some good gear at some point. If you want do do any touring even 500 mile weekend stuff I would say you will not regret the money you spend on good gear. My advise is to go to shops and try stuff on and try not to look to close at the price tags. Think about what at trip to the emergence room cost, God forbid. Please buy a pair of gloves soon and enjoy the ride! @duck wrote: You don't need a helmet. You're in Wisconsin. That might be the reason why some Wisconsinners seem older—but not wiser—than their years. Wisconsinites are a tough breed. They still go to Packers games outdoors in the winter. @duck wrote: Wisconsinites are a tough breed. They aren't that tough. The Packers wear helmets. Safety studies I have read agree that there is little difference between helmets. It's more important to be wearing one than what brand or model it is. I won't go out without a full face helmet; back in my enduro racing days I did a few face plants with older style helmets and don't want to do that again. The modular flip up models are great because they allow you to get some air when you're stuck in traffic and when you stop for gas, etc. The rest of the gear is important, too. The main thing is to have a good abrasion resistant outer shell and CE rated body armor in the back, shoulders, elbows, hips and knees. You can spend thousands on gear. Personally, I have about $500 in mine. Careful shopping on Craig's List and eBay can save a lot of money if you are on a tight budget. I got hit last Fall by a car doing 75mph, totaling the car and my bike, but only had some sprains and bruises. My pants got tore up and had to be replaced, and I am replacing the helmet, even though it only has a few scratches. Boots, gloves and jacket all survived. Even cheap gear is way better than none at all. What I have found is that as the price increases, the protection stays pretty much the same as long as the armor is there and the shell is Cordura of 600 denier or better. What you get for more money is a better, more stylish fit, better ventilation and rain protection. The really cheap stuff usually has armor that doesn't stay in the proper place, seams that fall apart after a few years, and leaks in a good rain. As was mentioned, try on lots of helmets. They come in many sizes and shapes as do heads. While many will disagree with me, as long as they are D.O.T. approved, the basic protection from impact and penetration will vary little. Fit and coverage is more important than price. While lots of graphics may be attractive, white will keep your head cooler on hot days, and next to hi-viz green is the easiest to see. You can spend a ton of money on a helmet that is a bit quieter, but I have found that good ear plugs do a better job at noise reduction than an extra $500 spent on a helmet. My favorites are 3M Skull Skrews which do a very good job and can last up to a month of daily wear. A little tip when using ear plugs, they go in much easier if you lube them with a LIGHT coat of hand sanitizer. I carry a couple extra pairs in a ziploc sandwich bag in my riding jacket pocket. @Dai wrote: The joke in the UK is that you're either a Shoei head or an Arai head. I've always been amused by this statement, and I get the joke, which is common on both sides of the Atlantic. Shoei offer just one head form and the multi-part soft lining of the contemporary models is meant to 'conform' to a variety of heads shapes, as well as liner and cheek pads of differing thickness of 5mm. Arai offer three head shapes; round, intermediate and narrow oval, with a plethora of differing thicknesses in 2.5mm increments of both cheek pad sets and head liners. I own both a Shoei X11 and an Arai Corsair-X. Both fit my intermediate scone very well, but both require earplugs over the long distance, especially with the air vents open. The most important part of any brand helmet is how they fit your head. Too loose and it'll shift as you turn to look over your shoulder during lane changes, possibly rotate the very moment you need it to protect you, and fatigue the rider more after a day of riding. Get a competent person to help you with snugness of fit. We often buy helmets that are too large for us. A helmet should almost be a bit uncomfortable the day you put it on. Allow for proper break-in, which could take weeks. If it's just right the day you buy it it'll be too loose shortly down the track. I gave up open face helmets ages ago. Over 50% of head injuries are jaw region related. The 'brain bucket' or 'skid lid' variety isn't worth a pot to piss in. Offroad helmets are meant to allow goggles and for the rider to get a bit of air and not for serious highway use. They're terrible for street use, mainly due to wind drag, unless you're talking about the Arai XD or Shoei Hornet (and some others) which offers a clear visor that protects from wind and noise. @Two Wheels Better wrote: The 'brain bucket' or 'skid lid' variety isn't worth a pot to piss in. The "value" of a puddin' bowl helmet is that if it's DOT rated you can be legal in states with helmet laws. Beyond that and keeping bald guys from getting sunburned, not worth much. The second one, I was hit from behind by another bike, I was doing about 70kph and he was doing about 165kph. Again booze, drugs, and stupidity were the cause. We were both badly busted and skinned. Luckily I had a full face helmet on as I slid down the road on my head and the chin peace had a lot of damage. Without it I would of lost my face. I only own full face helmets now, I bought a flip face 5 years ago and it is great, very versatile. I don't ride super fast anymore but I always dress for the unexpected, Kevlar Jeans, Jacket, Gloves and Strap up Boots. Don't even bother with the skull cap. Although the only times I have ever made impact were on the top. Full face is best - I used to have an old HJC (heavy - good protection when I wacked the back of it on the road), then an LS2 Stream (~$100!!!! for DOT and ECE compliance, pretty quiet - padding not great), now a Schuberth S2 Sport (sale! Sweet padding, not as quiet as I expected but ok). 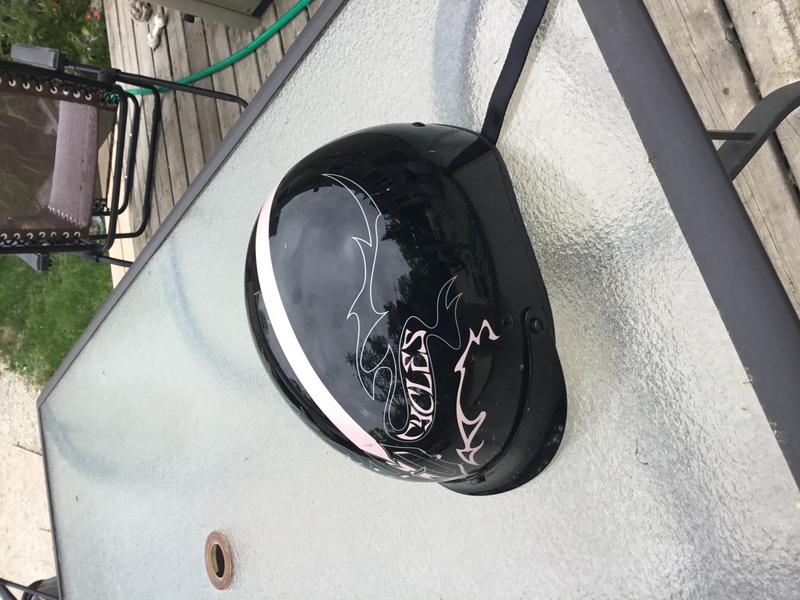 Protect your head immediately if you ride at night. The tail light on the K100RS and K100RT might as well be a night light under your shirt - barely visible.